On Thursday night, Clint Eastwood, the Academy Award-winning actor, director, and screenwriter, delivered one of the most bizarre political convention speeches in American history. 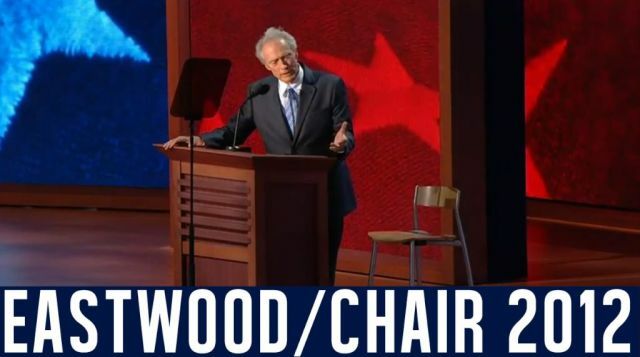 Speaking without prepared remarks, Eastwood carried on an imaginary conversation with an invisible President Obama seated in a chair next to him on the convention stage. I can’t even begin to try to summarize Eastwood’s rambling address to a bewildered audience and press corps. Rep. Paul Ryan (R-Wis.), Mitt Romney’s vice presidential pick, looked less than pleased with Eastwood’s speech. And the Hollywood star’s invisible Obama skit quickly spawned its own Twitter feed—@InvisibleObama—and a satirical 2012 presidential bid. As well as #eastwooding. So I—so I’ve got Mr. Obama sitting here. And he’s—I was going to ask him a couple of questions. But—you know about—I remember three and a half years ago, when Mr. Obama won the election. And though I was not a big supporter, I was watching that night when he was having that thing and they were talking about hope and change and they were talking about, yes we can, and it was dark outdoors, and it was nice, and people were lighting candles. I was even crying. And then finally—and I haven’t cried that hard since I found out that there is 23 million unemployed people in this country. Now that is something to cry for because that is a disgrace, a national disgrace, and we haven’t done enough, obviously—this administration hasn’t done enough to cure that. Whenever interest they have is not strong enough, and I think possibly now it may be time for somebody else to come along and solve the problem. I mean, what do you say to people? Do you just—you know—I know—people were wondering—you don’t—handle that okay. Well, I know even people in your own party were very disappointed when you didn’t close Gitmo. And I thought, well closing Gitmo—why close that, we spent so much money on it. But, I thought maybe as an excuse—what do you mean shut up? I’ve got to to hand it to you. I have to give credit where credit is due. You did finally overrule that finally. And that’s—now we are moving onward. I know you were against the war in Iraq, and that’s okay. But you thought the war in Afghanistan was okay. You know, I mean—you thought that was something worth doing. We didn’t check with the Russians to see how they did it—they did there for 10 years. So anyway, we’re going to have—we’re going to have to have a little chat about that. And then, I just wondered, all these promises—I wondered about when the—what do you want me to tell Romney? I can’t tell him to do that. I can’t tell him to do that to himself. You are an—an ecological man. Why would you want to drive that around? Okay, well anyway. All right, I’m sorry. I can’t do that to myself either. And—so—they are just going to come around and beg for votes every few years. It is the same old deal. But I just think it is important that you realize that you’re the best in the world. Whether you are a Democrat or Republican or whether you’re libertarian or whatever, you are the best. And we should not ever forget that. And when somebody does not do the job, we got to let them go. We don’t have to be…what I’m saying, we do not have to be mental masochists and vote for somebody that we don’t really even want in office just because they seem to be nice guys or maybe not so nice guys, if you look at some of the recent ads going out there, I don’t know.